Commercial HVAC Services for DFW : Perry HVAC, the "Rooftop Experts"
At Perry HVAC, we offer a variety of commercial HVAC services for clients on both Single Package and Split Systems. We are brand neutral and always provide you with the best solution for your job. Have a pending insurance claim due to copper theft or vandalism? We can provide temporary HVAC equipment to keep your business up and running in the interim. 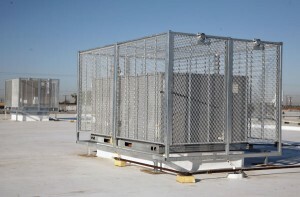 We can also install security cages to help prevent copper theft. 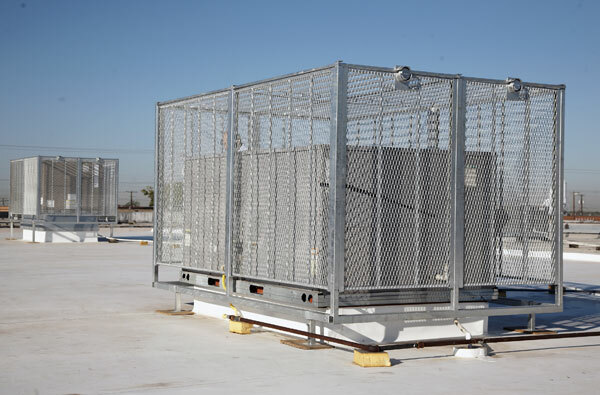 HVAC security cages help prevent copper theft! Have storm damage to your rooftop unit due to lightning strikes, hail, tornadoes, or high wind? Let us provide temporary HVAC equipment while your insurance claim is being settled, keeping your business up and running. Does your building need to be re-roofed? Let our professional roofing contractors removing and replacing existing Roof Top HVAC Equipment for you. We serve the greater Dallas Fort Worth area. Below is a list of specific cities. If you're not sure we cover your neck of the woods, just give us a call at 214-714-6365! Thieves ruined two of our air conditioning units by stealing the copper from the units – in July! Trying to get the attention of any HVAC firms in the heat of the summer was a nightmare. Perry HVAC stepped in to save the day. They worked with us, and our insurance carrier, to expedite ordering and replacing the damaged units and even assisted us with obtaining portable chilling units to allow us to continue to conduct business until our units were replaced. We were impressed, not only with the urgency in which they responded to our needs, but also by the professionalism exhibited by everyone we dealt with at Perry. We highly recommend Perry HVAC.